Posted: March 29, 2018 2:35 p.m.
We’re welcoming a new neighbour to our Regina community. H&M, the fashion retailer, opened its first store in Saskatchewan today in Regina’s Cornwall Centre. 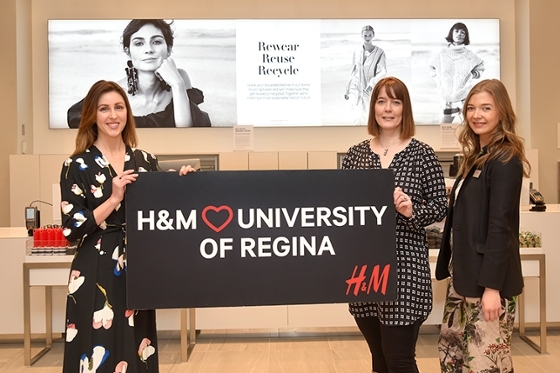 To celebrate the grand opening, H&M reached out to partner with the University of Regina, creating a scholarship program for students in the Environmental Studies program. On this day of firsts, H&M shared that this is the first time the fashion retailer has partnered with a university in Canada. Erin Limacher, Director of Communications and Marketing at the University of Regina, was on site at H&M’s grand opening to discuss the positive impact of community partnerships. H&M is the first fashion company to roll out a global garment recycling program. Through this initiative, H&M customers at Cornwall Centre can help save natural resources and contribute to a reduced environmental impact by bringing in unwanted pieces of clothing and textiles from any brand, in any condition while in the store. In 2017 alone, H&M Canada diverted more than 640,000 lb. of unwanted textiles from landfills.